Using Honey with Facebook, Instagram, and Twitter feeds. How to use our social media integration to automatically pull content from outsides sources into Honey. Our social media allows you to pull content from your favorite social sources — Facebook, Instagram, and Twitter — into Honey in real time. Once set up, new content from the social media source will post in Honey just like the posts your team members share. We'll walk you through the steps to get all set up. Navigate to your integrations page. Then, click Integrations in the page header. Configure your social media integrations. Beneath Add an Inbound Integration, click icon of the source from which you'd like to pull content. This will unfurl all the setup fields. Follow the steps to authenticate with your social media account. In some cases, you'll need to authenticate with your personal social account, but don't worry, we don't save your information and will not post any of your personal content. Then, use the setup fields to choose the source profile — Twitter feed, Instagram feed, or Facebook — which which you'd like to pull content. Then, in the Post to Topic field, choose the topic in which you'd like your content source's posts to publish. If you'd like, use the Daily Post Limit toggle and field to select the maximum number of posts published from your content source each day. Lastly, use the Backfill Count field to select how many — if any — perviously published posts you'd like to share to Honey. Once set up, these will import immediately. Once you're happy with your settings, click the blue Create Integration setting. Manage your social media integrations. On the left, beneath Inbound Integrations, you'll see your list of active integrations. Use the toggle next to each to disable the integration or use the settings cog to edit or permanently delete the integration. Manage all social media integrations in your organization. Select Admin from the menu. 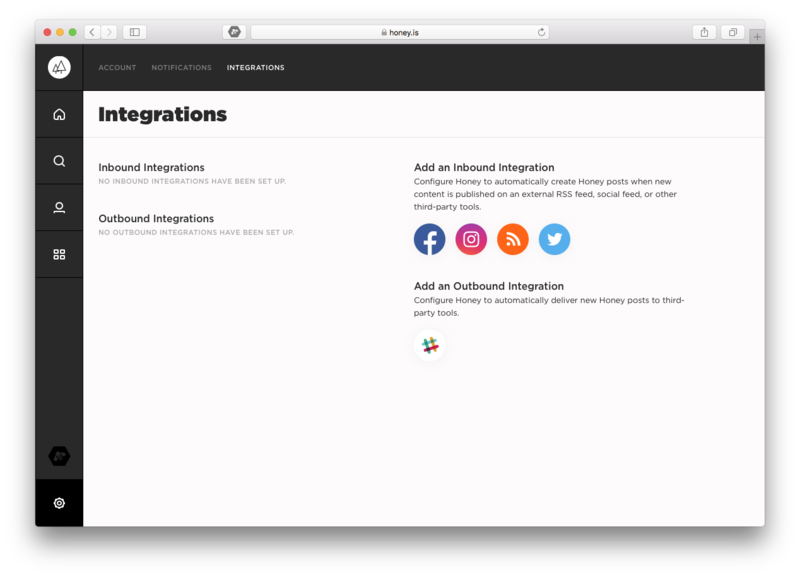 Beneath Inbound Integrations, you'll see your list of active integrations.